Severe damage and casualties in the Port-au-Prince area. Felt throughout Haiti and the Dominican Republic, in Turks and Caicos Islands, southeastern Cuba, eastern Jamaica, in parts of Puerto Rico and the Bahamas, and as far as Tampa, Florida and Caracas, Venezuela. 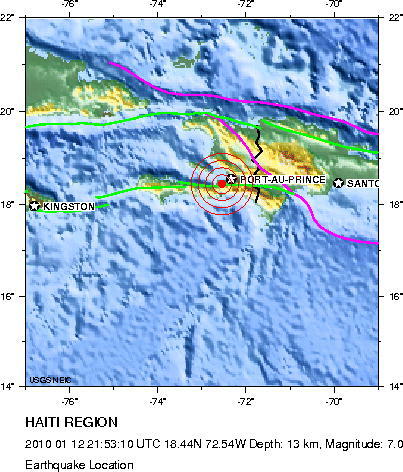 The January 12, 2010, Haiti earthquake occurred in the boundary region separating the Caribbean plate and the North America plate. This plate boundary is dominated by left-lateral strike slip motion and compression, and accommodates about 20 mm/y slip, with the Caribbean plate moving eastward with respect to the North America plate. Haiti occupies the western part of the island of Hispaniola, one of the Greater Antilles islands, situated between Puerto Rico and Cuba. 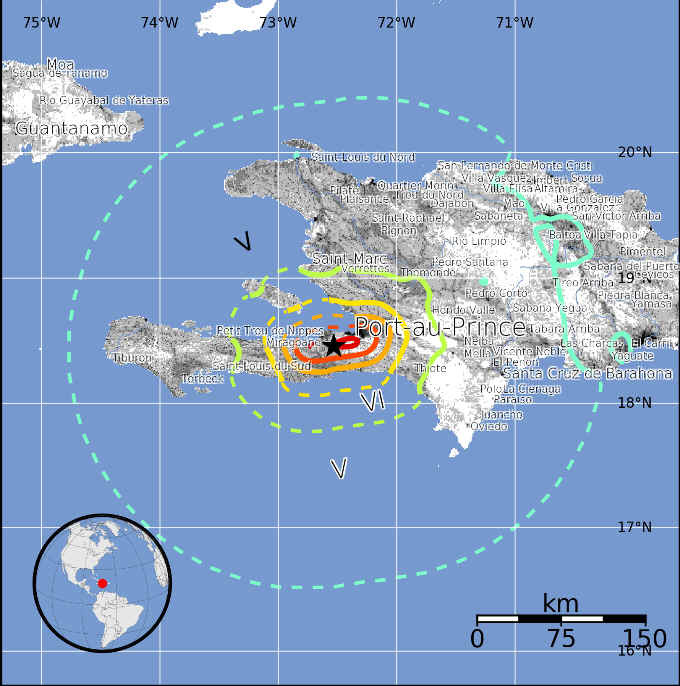 At the longitude of the January 12 earthquake, motion between the Caribbean and North American plates is partitioned between two major east-west trending, strike-slip fault systems -- the Septentrional fault system in northern Haiti and the Enriquillo-Plantain Garden fault system in southern Haiti. 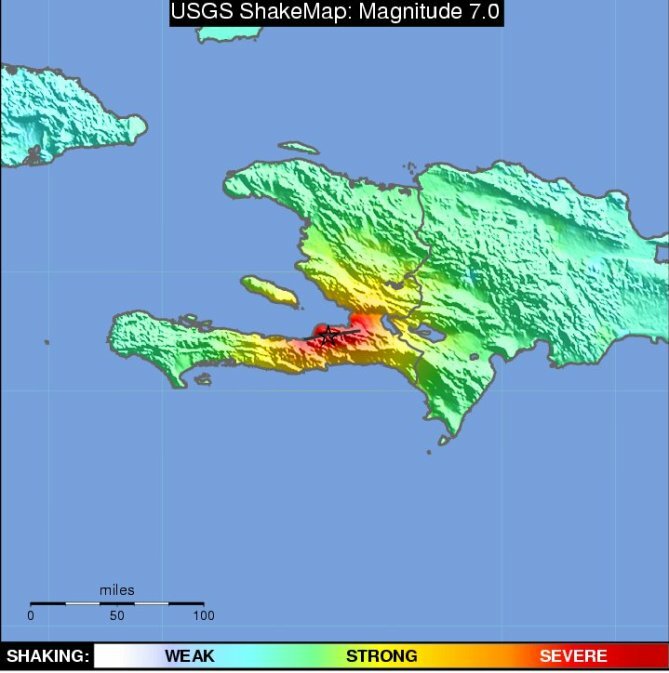 The location and focal mechanism of the earthquake are consistent with the event having occurred as left-lateral strike slip faulting on the Enriquillo-Plantain Garden fault system. This fault system accommodates about 7 mm/y, nearly half the overall motion between the Caribbean plate and North America plate. The Enriquillo-Plantain Garden fault system has not produced a major earthquake in recent decades. The EPGFZ is the likely source of historical large earthquakes in 1860, 1770, and 1751, though none of these has been confirmed in the field as associated with this fault. Sequence of events possibly associated with the Enriquillio fault in 1751-1860 are as follows. October 18, 1751: a major earthquake caused heavy destruction in the gulf of Azua (the eastern end of the Enriquillio Fault) which also generated a tsunami. It is unclear if the rupture occurred on the Muertos thrust belt or on the eastern end of Enriquillio Fault. Nov. 21, 1751: a major earthquake destroyed Port Au Prince but was centered to the east of the city along the Cul de-Sac plain. 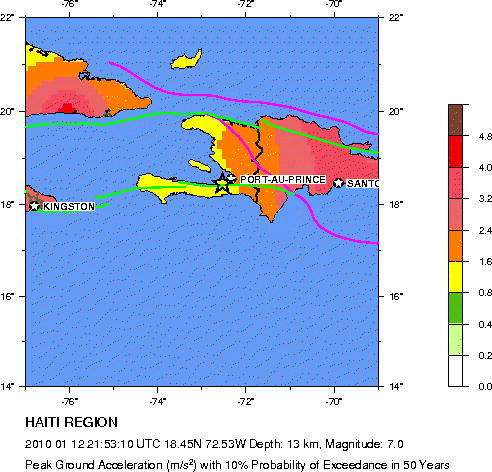 June 3, 1770: a major earthquake destroyed Port Au Prince again and appeared to be centered west of the city. 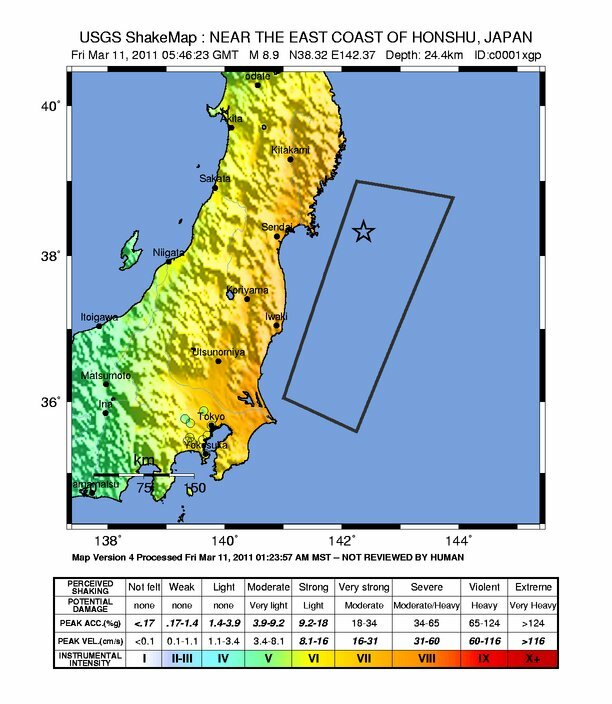 As a result of the 1751 and 1770 earthquakes and minor ones in between, the authorities required building with wood and forbade building with masonry. The island of Hispaniola is the second largest island in the Caribbean, at 29,273 sq miles, (75,843 sq km). 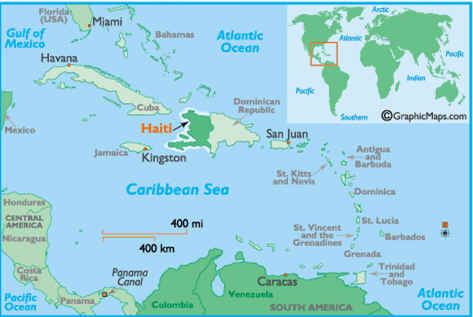 Haiti occupies about 1/3 of the island, while the Dominican Republic controls the balance of land. Details The island of Hispaniola, the second largest island in the Caribbean, contains two separate countries; the Dominican Republic and Haiti. Columbus claimed Hispaniola in 1492, and it later became the major launching base for the Spanish conquest of the Caribbean, as well as the American mainland. Subsequently, disease and slavery were introduced by the Spanish conquistadors, and the indigenous peoples were destroyed. The native Taino Amerindians - who inhabited the island of Hispaniola when it was discovered by COLUMBUS in 1492 - were virtually annihilated by Spanish settlers within 25 years. In the early 17th century, the French established a presence on Hispaniola. In 1697, Spain ceded to the French the western third of the island, which later became Haiti. The French colony, based on forestry and sugar-related industries, became one of the wealthiest in the Caribbean but only through the heavy importation of African slaves and considerable environmental degradation. In the late 18th century, Haiti's nearly half million slaves revolted under Toussaint L'OUVERTURE. 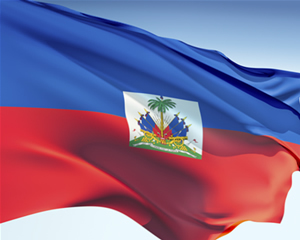 After a prolonged struggle, Haiti became the first black republic to declare independence in 1804. The poorest country in the Western Hemisphere, Haiti has been plagued by political violence for most of its history. After an armed rebellion led to the forced resignation and exile of President Jean-Bertrand ARISTIDE in February 2004, an interim government took office to organize new elections under the auspices of the United Nations Stabilization Mission in Haiti (MINUSTAH). Continued violence and technical delays prompted repeated postponements, but Haiti finally did inaugurate a democratically elected president and parliament in May of 2006. Economy ::Haiti Economy - overview: Haiti is the poorest country in the Western Hemisphere with 80% of the population living under the poverty line and 54% in abject poverty. Two-thirds of all Haitians depend on the agricultural sector, mainly small-scale subsistence farming, and remain vulnerable to damage from frequent natural disasters, exacerbated by the country's widespread deforestation. While the economy has recovered in recent years, registering positive growth since 2005, four tropical storms in 2008 severely damaged the transportation infrastructure and agricultural sector. US economic engagement under the Haitian Hemispheric Opportunity through Partnership Encouragement (HOPE) Act, passed in December 2006, has boosted apparel exports and investment by providing tariff-free access to the US. HOPE II, passed in October 2008, has further improved the export environment for the apparel sector by extending preferences to 2018; the apparel sector accounts for two-thirds of Haitian exports and nearly one-tenth of GDP. Remittances are the primary source of foreign exchange, equaling nearly a quarter of GDP and more than twice the earnings from exports. Haiti suffers from high inflation, a lack of investment because of insecurity and limited infrastructure, and a severe trade deficit. In 2005, Haiti paid its arrears to the World Bank, paving the way for reengagement with the Bank. Haiti is expected to receive debt forgiveness for about $525 million of its debt through the Highly-Indebted Poor Country (HIPC) initiative by mid-2009. The government relies on formal international economic assistance for fiscal sustainability. Illicit drugs: Caribbean transshipment point for cocaine en route to the US and Europe; substantial bulk cash smuggling activity; Colombian narcotics traffickers favor Haiti for illicit financial transactions; pervasive corruption; significant consumer of cannabis. C) The coat of arms of the Republic are: a Palmette surrounded by the liberty cap, and under the palms a trophy with the legend: In Union there is Strength (L'Union Fait la Force). Since 1697 and the Treaty of Ryswick by which Spain formally recognized French control of the western third of the island, until February 1803, the French flag rules over the French colony of Saint-Domingue. In 1793, Toussaint Louverture, black leader, and precursor to Haiti’s independence, aligns with the French tri-colored flag. In 1801, Louverture is nominated governor of the entire island, and with the Constitution of July 8, 1801 becomes governor for life. In June 1802, Toussaint Louverture is captured by Napoléon Bonaparte and deported to, and jailed in France where he dies. In Petite Rivière de l'Artibonite, Jean-Jacques Dessalines, chief of the black rebels, and Alexandre Pétion, leader of the mulattos, decide in February 1803 to stop fighting alongside the French. During the Arcahaie Congress, Dessalines, on May 18, 1803, removes the white band from the French flag – which was used in Haiti during the French rule, and thereby creates the first Haitian flag, symbol of the alliance of blacks and mulattos in their fight for freedom. Dessalines, who orders that the phrase “Freedom or Death” be inscribed on the flag, is soon nominated General of the Insurrection. A relative of his, Catherine Flon, is entrusted with the task of sewing back together the blue (hoist side) and red bands of fabric to form the new Haitian flag. On November 18, 1803, French troops capitulate in Vertières; Haiti is independent. On January 1, 1804 the generals of the revolution decide to change the flag so that the bands are now horizontal. This is the first flag of the free and independent republic. This new bi-colored flag is confirmed by article 192 of the Constitution of 1843. On October 8, 1804, Dessalines proclaims himself Emperor and takes the name Jacques I. On May 20, 1805 he adopts a new flag of two vertical bands; one black, for Death, and one red, for Freedom. After the assassination of Dessalines at Pont Rouge on October 17, 1806, the country is divided in two for 14 years; the north ruled by Henri Christophe and the south and west ruled by Alexandre Pétion. Pétion immediately reverts to the blue and red flag of 1804, to which he adds the inscription “L’union fait la force (strength in unity). At the center, the coat of arms of the Republic, adorned with the Phrygian hat (liberty cap), is placed on a white square background. This flag will be hoisted at the National Palace for 158 years, until 1964. On December 27, 1806 General Henri Christophe becomes president and is recognized in the North, North West, and in 1807, Artibonite Departments. On March 28, 1811, he proclaims himself king and takes the name Henri I (1811-1820). The self-made monarch keeps the colors of the imperial flag of the Kingdom of the North (1805), but changes it slightly; red in the hoist and black in the fly with, at the center, a shield with a phoenix under gold five-pointed stars, all on a blue background; the shield bears a crown and the Latin inscription 'Ex Cineribus Nascitur' (« From the ashes we will arise »). In 1818, Henri and his kingdom are vanquished by Alexandre Pétion’s conquest of the North. Pétion, who had been proclaimed president on March 19, 1807, imposes the horizontal blue and red flag to the North. On October 8, 1920 he is succeeded by Jean-Pierre Boyer who maintains the same flag. In February 1822, Jean-Pierre Boyer annexes the Spanish part of the island (present day Dominican Republic), which a few months earlier, on November 30, 1821, had proclaimed its independence from Spain under the name of "Republica del Haiti Espanol" (Spanish Republic of Haiti), as well as declared its alliance with Colombia. The flag of the Spanish Republic of Haiti is raised in the early weeks of 1822, but the new Republic will soon be dissolved by Boyer. An attempt to reinstate the black and red flag fails in 1844. In 1847, Faustin Soulouque is elected president, but proclaims himself Emperor under the name Faustin I (1849-1859). The 1849 Constitution keeps the blue and red flag but replaces the coat of arms by the shield. The Empire of Faustin I ends on January 15, 1859 and the coat of arms of the Republic regains its original position at the center of the flag. In 1957, François Duvalier, Papa Doc, is elected president, and in 1960 seizes all powers. In 1963, he establishes a single party system and a new Constitution is adopted on May 25, 1964. The new Constitution returns to the black and red flag, although this time the coat of arms of the Republic remains. This flag becomes official on June 21, 1964. On April 21, 1971 Duvalier dies and is replaced by his son Jean-Claude, who is proclaimed president for life. Following a popular uprising, Jean-Claude is removed from office in February 1986. On February 17, 1986, 10 days after the departure of Jean-Claude Duvalier, the Haitian nation reverts to the blue and red flag, which is ratified a year later by the official adoption of the March 29, 1987 Constitution. Spanish build the New World's first settlement at La Navidad on Haiti's north coast. island into French-controlled St. Domingue and Spanish Santo Domingo. French and subsequently exiled to France where he died. November marks the ultimate victory of the former slaves over the French. former Taino-Arawak people, meaning "mountainous country." Emperor Jean-Jacques Dessalines is assassinated. from Spain. The entire island is now controlled by Haiti until 1844.
francs to repay the indemnity and gain international recognition. abolitionist Frederick Douglass as its Consular Minister. Charlemagne Péralte, who is betrayed and assassinated by Marines in 1919.
massacred by Dominican soldiers under the orders of President General Trujillo. with tens of thousands killed or exiled. The first Haitian "boat people" fleeing the country land in Florida. Widespread protests against repression of the nation's press take place. workers and political parties to organize are quickly and regularly crushed. with imported breeds largely fail. Pope John Paul II visits Haiti and declares publicly that, "Things must change here." literacy program. Anti-government riots take place in all major towns. Massive anti-Government demonstrations continue to take place around the country. months later and in November General Prosper Avril unseats Namphy. Government led by Supreme Court Justice Ertha Pascal-Trouillot. U.S. Vice-President Dan Quayle visits Haiti and tells Army leaders, "No more coups." Nations (UN) to help organize general elections in December. him from the National Palace following massive popular protest. 1,000 people are killed in the first days of the coup. lead to the Washington Protocol, which is ultimately scuttled by the coup régime. support efforts by the OAS to find a solution to the political crisis. monitor respect for human rights and the elimination of all forms of violence. order to pressure the coup régime to give up power. pledging support for President Aristide's return and the rebuilding of the nation. Aristide supporter Antoine Izmery is executed outside of a local church. supported by Argentine, Canadian, French, Dutch and U.S. warships. the de facto authorities to leave the country. departure of the military régime. step down and leave the country. On October 15th, President Aristide and his Government-in-exile return to Haiti. In June Haiti hosts the annual OAS General Assembly at Montrouis. Claudette Werleigh becomes President Aristide's fourth Prime Minister. modernization are announced as the Goverment's priorities. presidential elections later that year, won by Aristide. international mediation efforts, a floundering economy and growing political violence. resignation of Aristide on Feb. 29, 2004 and his exile to the Central African Republic. 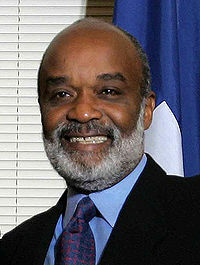 as acting President until the February 2006 elections. the rising price of food commodities. Parliament. She is the second female Prime Minister is Haiti’s history.